There are many family fun ideas in Northern Arizona and stretches for Amarillo across New Mexico and into Arizona. The desert vistas of Northern Arizona are enchanting. They are sights that my family and I love to see repeatedly. We recently got back from a road trip there that was nothing short of spectacular. We had been to the Grand Canyon — obviously synonymous with Arizona — a few times. We wanted to explore the other things to do in this great state. We began our journey in the breathtaking Painted Desert. We had been to the Grand Canyon before. But I must admit, I never heard of the Painted Desert. Nor did I know what to expect. These rocky badlands are just layers and layers of colors. It’s an enormous place, stretching from the Grand Canyon at one end and to the Petrified Forest at the other. 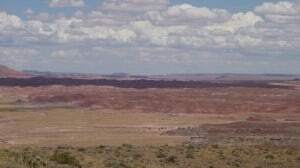 We learned a host of natural events shaped the Painted Desert over the millennia. Earthquakes, floods, volcanoes, and more all made their contribution when it came to forming these magnificent natural sculptures. 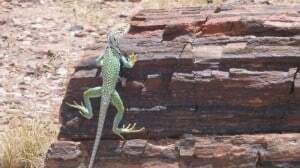 We combined our Painted Desert visit with the adjacent Petrified Forest National Park. It’s easy to do, especially starting out at the Painted Desert Visitor Center. 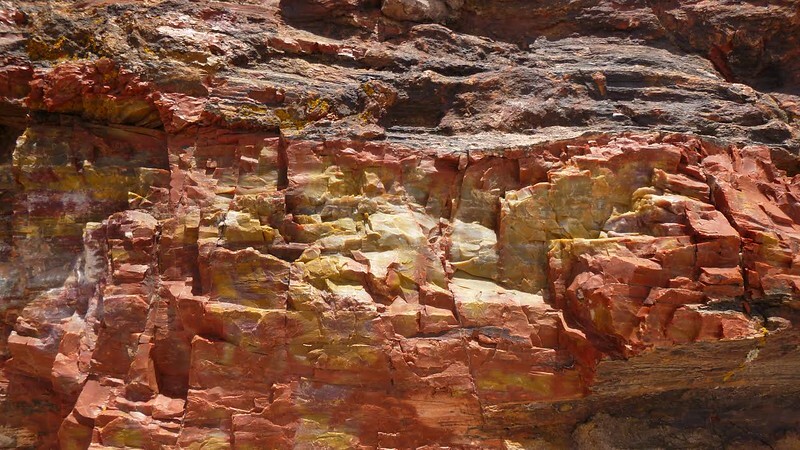 It’s located within the Petrified Forest area. However, we did most of our exploring in the Painted Desert by car, just getting out at the lookout points. And my new Gobi HoboRoll was so convenient and perfect for this type of activities. Due to time constraints, we did not stop at the Painted Desert Inn National Historic Landmark. It’s a museum now, but it’s been many things over the years, including a trading post and a hotel. We regret not making it to see what we learned was an interesting silversmiths demonstration. Exploring the Petrified Forest was next. We’d already been to the Visitor Center and Gift Shop (and bought some geodes and boxes of petrified wood) so we were ready to explore. There are strict rules to not remove any of the petrified wood from the park which is why we bought some for our rock-loving sons in the gift shop. Here we did do some easy hiking in order to see some of the wood up close. Having never seen petrified wood before, it was very interesting to all of us. I was glad we brought our stainless steel water bottles along because it was hot. One of the highlights of our visit was the hike out to Agate House. We were amazed by the number of things the ancient Pueblo people were able to make out of petrified wood. They crafted all kinds of tools, but the Agate House is probably the most impressive thing they created. Archaeologists think the original structure was about 900 years old. The structure that’s on the site today was built in the 1930’s, but it’s still an impressive feat and an amazing sight. We also spent some time at Puerco Pueblo, a larger ancient settlement. The number of structures here, some underground, is really breathtaking. Petroglyphs adorn a few of the walls. 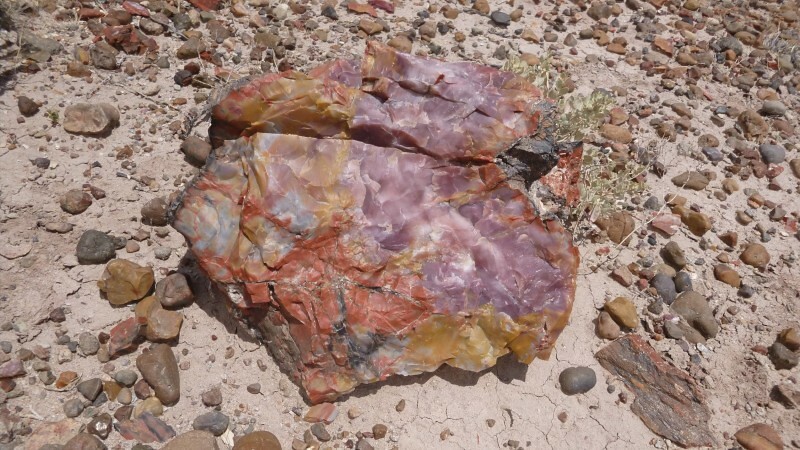 Even if you don’t want to or are unable to get out to touch the petrified wood and explore, you can easily drive through both the Painted Desert and Petrified Forest and be able to appreciate the wonder and beauty of them both. We had been seeing a lot of billboards for the Meteor Crater, which is located just outside of Winslow. So the next day, we traveled there. I have to say, I didn’t know what to expect as it really is kind of in the middle of nowhere. We had only ever heard of it from the billboards and weren’t sure if it was a gimmicky tourist lookout spot or what it was going to be. We hadn’t researched this in advance and were a little taken aback by the price. It is $18 for adults, $16 for individuals over 60 years old, and $9 for children ages 6 and older. We were pleasantly surprised though that once inside there was a LOT to do. This is a “real” site. 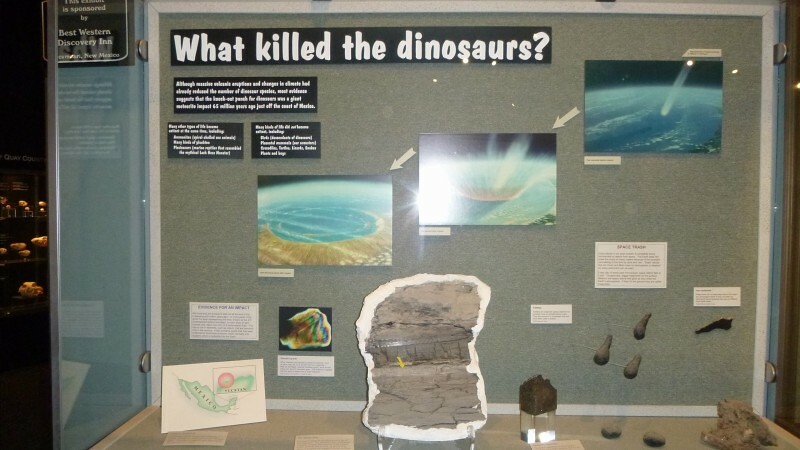 There is an Interactive Discovery center which includes many displays and exhibits, a movie, tours and presentations. My kids absolutely loved the gift shop which included a large “rock shop” area. It was really cool to see the huge variety of interesting rocks they had. 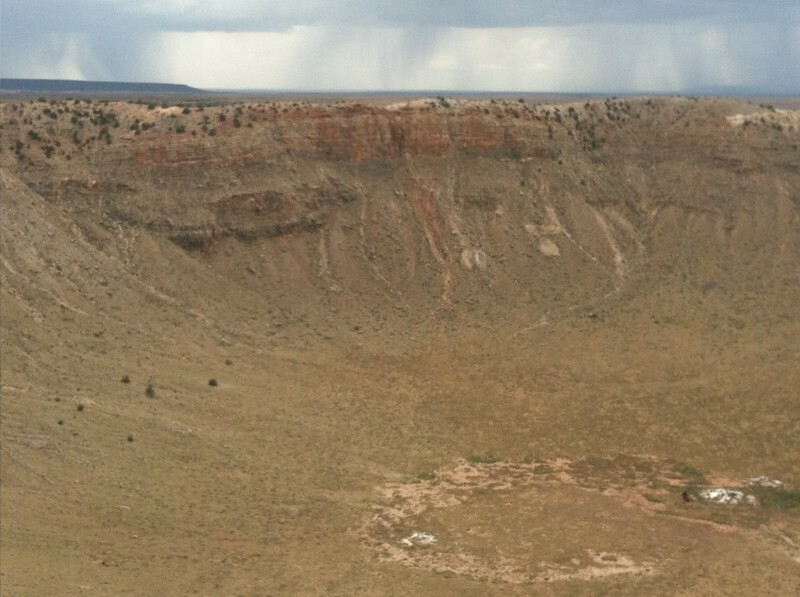 About 50,000 years ago, a meteor traveling at an enormously high speed collided with Earth, creating this incredibly well-preserved crater. It’s nearly impossible to conceive how large this meteor was. It left a hole that’s a mile across and more than two miles in circumference. Its greatest depth is 550 feet. 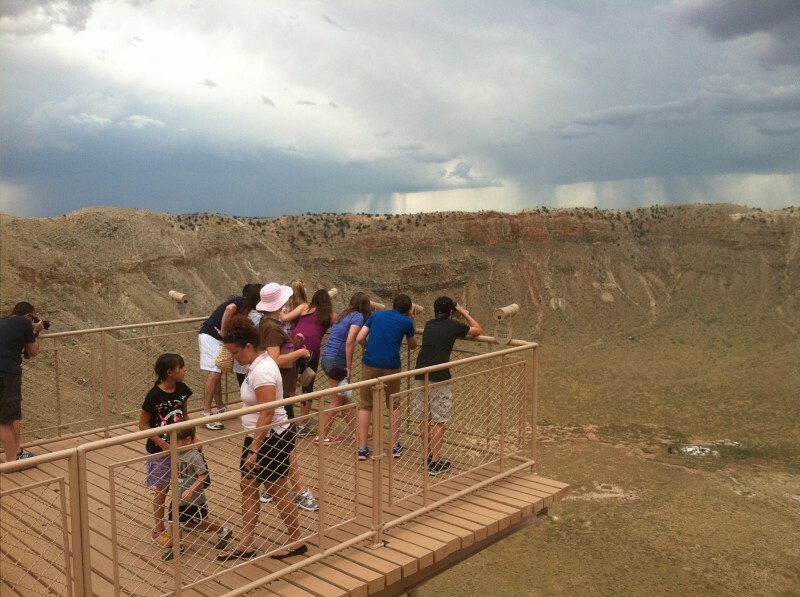 You can see the crater from inside their facility or by walking on one of their trails to their observation points. 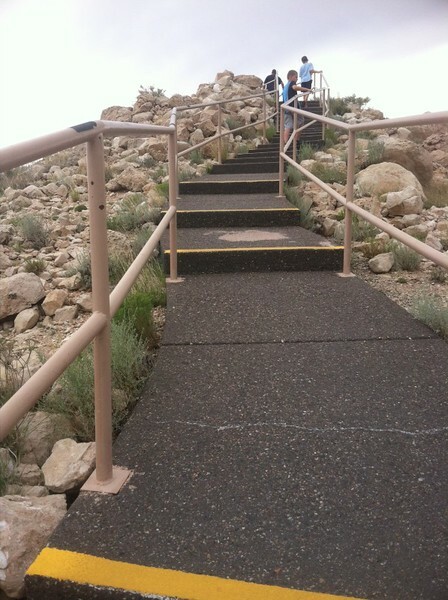 There are quite a few steps to get to the top of one of the lookout points. The kids had a fantastic time on the observation trails. At the closest site, there are free telescopes which were really helpful because without them, I wasn’t able to see the objects from that far away. In total, we spent about two hours here, but easily could have stayed longer. There is a Subway restaurant onsite as well. My husband and sons had never been. My only trip there was in 1996. It had changed a bunch since then, when it was much less commercialized. There were rows and rows of benches as well as booth spaces outlining the perimeter of the park. Most of the stations were filled with Native Americans selling their wares. It was $5 per person; ages 6 and under are free. 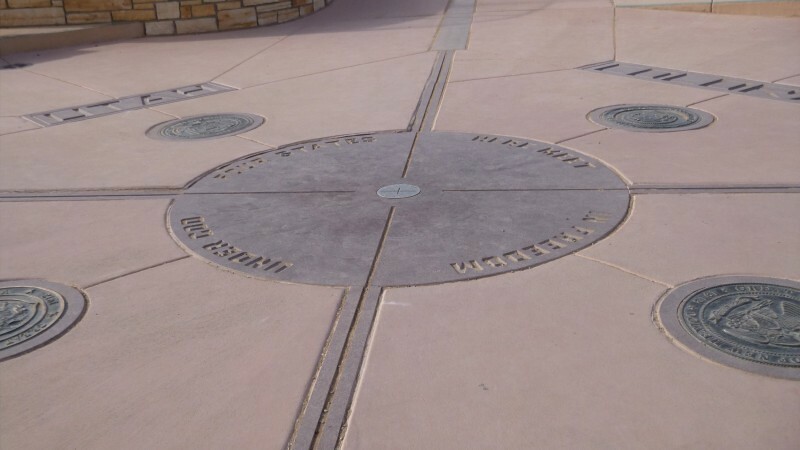 This is a place that everyone should try to visit at least once in their lives as it is the only place in the United States where you can stand in all four states at the same time. 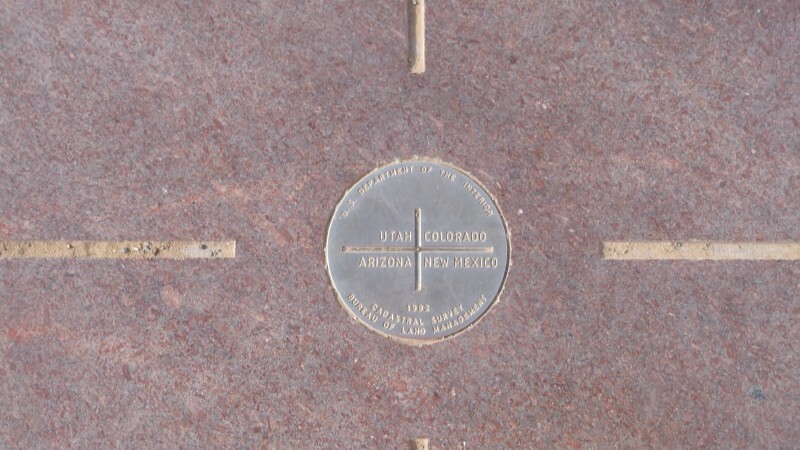 Colorado, Utah, Arizona, and New Mexico all intersect. If there is an empty moment when you can get a picture with your group standing on the “x,” don’t wait, take it. There are often a lot of people here, especially in the summer. There area is very remote, and there isn’t much to do in the surrounding areas. Plan to bring your own food and drinks. There are outhouses but no water. Our itinerary included another classic road trip destination. Jerome, Arizona has a number of nicknames. In its heyday, most people just referred to it as the wickedest town in the west. It was a boom town created by a nearby copper deposit. At its height, it boasted a population of more than 15,000. Unfortunately, the good times didn’t last. The Great Depression hit the area hard. Eventually, there were only about 50 people living in Jerome. The population has stabilized at around 450 today. It’s a tourist destination and an artists’ colony. Most of the buildings date back to after the devastating fire of 1899, so it is certainly picturesque. This place is loaded with colorful characters and sights. It was raining hard when we were there. We walked for a bit and stopped at the Sliding Jail. There are several museums, shops, and tours of the area, even haunted tours. But because of the rain, our boys didn’t want to stay, so we didn’t spend much time here, unfortunately. We look forward to returning to see Jerome State Historic Park, Douglas Mansion, and the mine museums. Eventually, we had to get back in the car for our final destination. Technically, this park is located in Utah, but we included it on our tour of northern Arizona. On a road trip filled with great places, this one just might be my favorite. 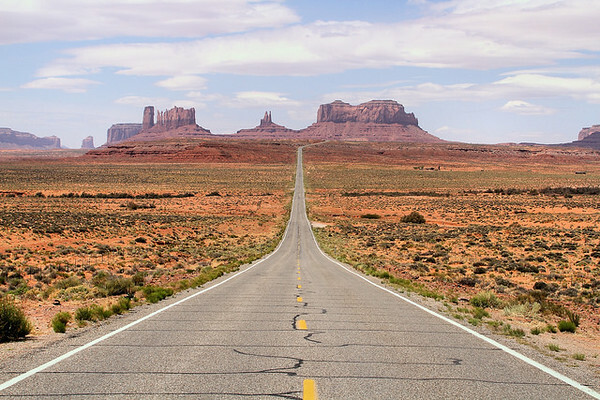 We made our way to Monument Valley, a place that is already familiar to many thanks to the countless movies, television shows, and photographs it has appeared in. However, nothing compares with seeing these amazing rock formations in person. It extends from Arizona to Utah. Like Four Corners, Monument Valley is also part of Navajo Nation Parks and Recreation. It is $20 per car for admittance for up to four people. There is a visitor’s center as well as a scenic drive. This area’s official name is Monument Valley Navajo Tribal Park. That’s because it’s actually contained within land owned by the Navajo nation. We began our visit at the Visitor’s Center, which has some really wonderful exhibits. In addition to illuminating how all of these amazing rock towers and mesas were formed, it also provides a lot of information about the Navajo people and their history. It’s really a very good introduction for visiting nearby Merrick Butte and Mitten Buttes. We picked up a map to help us find our way, and then we were off. The light and shadow in this place are truly one-of-a-kind. We never seem to have enough time while on our vacations. Still, with the six days we had, we were happy we were able to see and do so much. It is fun on road trips being able to go at our own pace, allowing for the kids’ schedules and interests. Visiting these sites in Northern Arizona, even at the peak of tourist season in July, were not terribly crowded, and were a lot of fun to explore. Our favorite type of vacation is the good old-fashioned road trip. Being on the road it’s the perfect antidote to the usual routine. I’m all for anything that keeps my family out of the airport and allows us to travel at our own pace, seeing lots of things along the way. We had a perfect opportunity to take a road trip while we were visiting family in Texas. We had planned to extend our trip to head further out west, taking things as they came. In just a few days, we covered a lot of ground, saw things we usually wouldn’t see, and learned a lot. We recently drove from Amarillo, Texas to Santa Fe, New Mexico, and it was a fun couple of days. The landscape between the two cities definitely has its breathtaking moments. Plus, there are a lot of fun attractions along the way that we all loved. 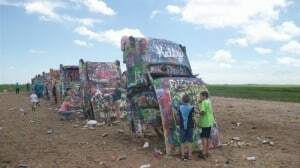 We started at a must-see site in Amarillo Cadillac Ranch. We learned that Amarillo has a long history of ranching, but I think those early settlers wouldn’t know what to make of this place. Basically, it’s one of America’s most famous roadside attractions. It sits to the west of Amarillo along famed Route 66. If you ever get to see it in person, you may not believe your eyes. That’s because there are 10 Cadillac’s partially buried in the desert, their tail fins reaching for the sky. 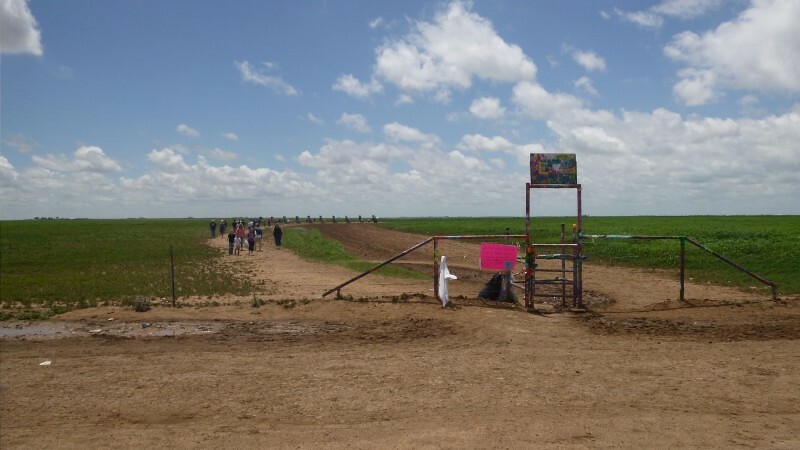 It began as an art installation in the 1970s with assistance from a local oil tycoon. Since those early days, countless people have stopped to admire the Cadillac and also to leave behind their own mark in the form of paint. The artists and their benefactor actually encouraged the practice of painting the Cadillac’s, and that’s exactly how we started our trip. First, I explained to my kids that spray painting cars is never appropriate in any other situation! Then, we had fun putting our own spin on an American tradition. What we spray painted will probably be painted over soon enough, but it was a once-in-a-lifetime experience for us. We were lucky that there were discarded bottles of spray paint left on the ground because we didn’t know to bring our own. We each used a bit. If we come back again, I would definitely plan ahead, and “pay it forward” by bringing and leaving some cans for others to enjoy. I felt there were two drawbacks to the place. One still very much bothers me. There were a lot of kids who were spray painting the yellow caterpillars who were crawling around. We always do our best to protect nature and especially “wildlife” so this was very disturbing to my family. Another downside was that there weren’t any recycling opportunities for all of those metal spray paint cans. I would love to have been able to collect the empty ones and put them in a recycling bin somewhere. I should add that this place is free. Back on the highway, we were soon heading west toward Santa Fe and approaching the small city of Tucumcari, New Mexico. A lot of people will say they’ve never heard of this charming little place, but the truth is that they are probably more familiar with it than they know. It’s been featured in countless movies, television shows and songs. However, we were there for the dinosaurs. 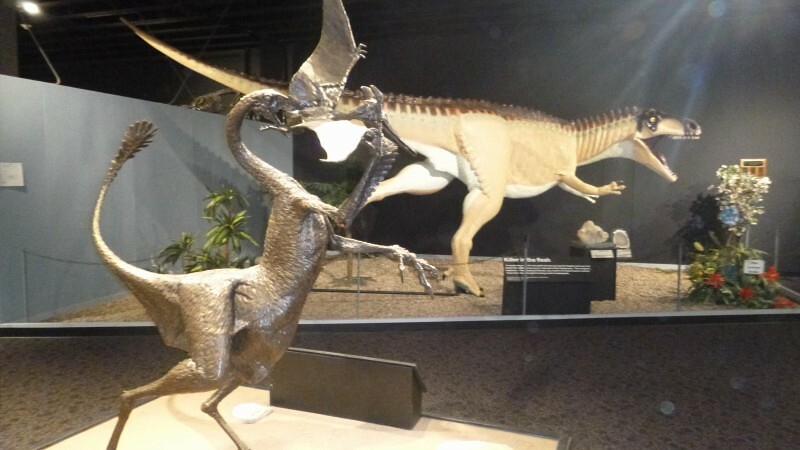 On the campus of Mesalands Community College we found an amazing dinosaur museum. I know my boys aren’t the only kids who are fascinated with these ancient creatures, so I’m willing to bet it’s a popular stop for a lot of families. We were the only ones there, and were able to spend time as we wanted. My kids spent a lot of time in the kids’ “dig” area and also enjoyed the other hands-on activities. We all enjoyed the Torvosaurus skeleton. Measuring 40 feet in length, this massive creature was related to the better known Tyrannosaurus rex. This is one museum that’s worth a repeat visit. There was just so much to see and learn about. They also had a very impressive gift shop, filled with lots of rocks, minerals, science kits, and so very much more. Overall, we were stunned to have randomly found such a high-quality museum and considered it to be quite a find. Soon we were back in the car and heading into Santa Fe. Our first stop was the gorgeous Loretto Chapel, which was built in the 1870’s. It’s no longer a church, but serves as a marvelous museum instead. 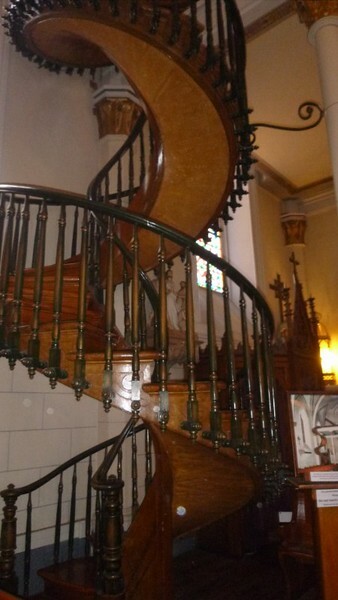 The crowning glory of the structure is the miraculous spiral staircase that leads up to the choir loft. Despite appearing to have no support structure, the staircase makes two complete turns and is indescribably lovely. We moved on to the San Miguel Mission after that. It’s Santa Fe’s oldest mission, with the earliest structure dating back to 1610. Moreover, this small building is loaded with interesting artifacts. The enormous bell is a Spanish relic from 1356. Deerskin and buffalo hide paintings that were used in the 17th century by missionaries teaching Native Americans about the Bible are also on display. This place provides an amazing history lesson for kids and adults. Even if you aren’t religious, you’ll be impressed by the beauty, peace and sheer age of the mission. Afterwards, we admired many of the shops and ate lunch in a cute restaurant. It was the Fourth of July when we were there, so later that evening we enjoyed the fest they had in town. When we visit next time, we plan to attend the Museum of International Folk Art and to ride bikes in town. This was a part of the country we had been to before, and probably will be again. It was interesting and fun to see and experience some of our nation’s history. There are a lot of reasons to like REI. One of the most relevant today is their always-inspired (and inspiring) ad series about amazing athletes from around the United States. But rather than profiling the kinds of athletes that appear at the Super Bowl or on cereal boxes, REI picks athletes who don’t have million dollar sponsorship’s. In most cases, you won’t have heard of these people before you watch the short film. “Fast Forward” is the latest in this series, and it profiles a cyclist named Lael Wilcox, as she journeys down the Arizona Trail. The Arizona Trail is a race – technically. It has no formal start time, and is the furthest thing from a media event. Participants keep track of their own performance time, all based on an honor system. 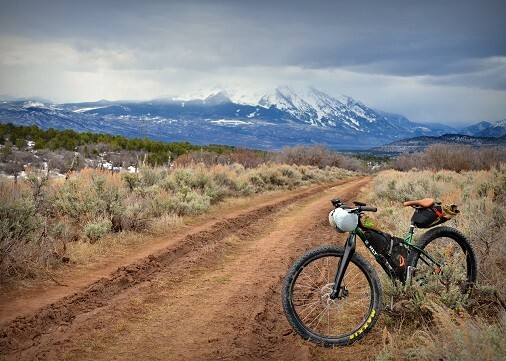 Lael Wilcox takes on the Arizona Trail hoping to finish the 800 mile course faster than any woman before. This endless single-track doesn’t make it easy for anyone. Featuring many different terrain types, elevations, and climates, many people who start do not finish. But Lael wants to set the record. Lael hasn’t always been a racer. She started traveling the world with her partner, working 6 months at home and traveling the remaining 6. They lived off of their bikes during these journeys, and it was only while she was out exploring the world in this way that she learned she could ride fast and long. Back on the Arizona Trail, things start out well but quickly go south. Lael’s throat starts to close up, and before long she is terribly sick. Though she wishes she could have continued, she expresses determination that this challenge will one day be behind her, like so many other long journeys around the world. For Lael, it’s not about money or recognition, but being able to surpass personal struggles. These are themes REI loves, and ones they try to elevate in their advertising.